Janette Poku Akom is the co-founder and Managing Director of Kwamoka Farms and Processing Ltd, a bamboo-based Agroforestry plantation. She has over 30 years of experience in Marketing and Management. 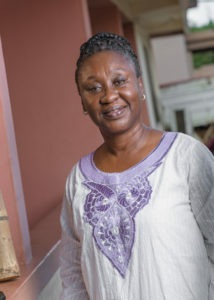 Janet started her career with Societe de Transport La Vente et L’Industrialisation (Cote D’Ivoire) before moving back to Ghana where she worked with Poku Transport Group of Companies as the General Manager. She latter co-founded Kwamoka Farms and Processing Ltd along with several other companies under the Kwamoka Group Ghana Ltd brand. Under her leadership, Kwamoka Group Ghana Ltd has improved its Customer Retention by 75% and has consequently increased the company’s bottom line. Kwamoka Farms and Processing Limited (KFPL), is a subsidiary of Kwamoka Group Ghana (KGG) – a limited liability company registered under the company’s code, 1963 (Act 179) in Accra. Kwamoka Farms is a free zone enterprise established to undertake general farming, tree plantation, afforestation and reforestation for environmental improvement. Currently, the company is developing 1200 acres of bamboo orchard intercropped with cowpea/corn. KFPL has also 200-acre degraded forest from Forestry Commission for the purpose of cultivating bamboo.